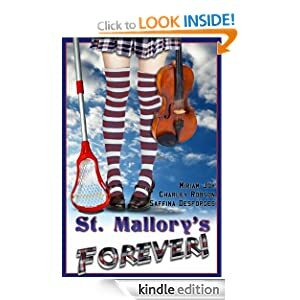 novel – St Mallory's Forever! We’ve got something exciting and exclusive on the blog today! That’s right. St Mallory’s’ humble home in cyberspace (this blog) is today hosting a sneak preview of the cover! Now, Mark wanted this over at MWi, but when I pointed out that, being the Official Blog and everything, we should have it first, he quickly agreed. I’ll admit that Charley and I were very over excited during discussions about this – all cool and professional on the outside, but inside we’re just going, we have a COVER DESIGNER! We’re, like, real authors now! And here it is. The cover.